John Barricelli is a third-generation baker who began his cooking career more than 25 years ago at the prestigious Culinary Institute of America in Hyde Park, New York. He has worked in New York City restaurants such as River Cafe and the Four Seasons Restaurant, and has been in business as a restaurant owner for 20 years. 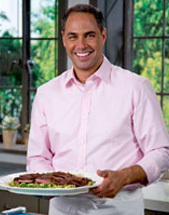 The host of "Everyday Baking from Everyday Food" and a co-host of "Everyday Food" on PBS, John is also a frequent contributor to as the Emmy-winning daily, nationally syndicated television series, "The Martha Stewart Show." John is currently the owner of SoNo Baking Company and Cafe in South Norwalk, Connecticut, which is the inspiration for his forthcoming baking book due in March 2010.